From its humble 1930’s era origins, DC has risen to become one of the biggest names in modern comics. Alongside Marvel, it is one of the “Big Two.” Though boasting a character roster including Superman and Batman, the lore behind both cape and cowl has been subject to numerous retcons, rewrites and reboots – most famously in 2011 when the company executed a complete relaunch of their publishing format and, more importantly, the entire DC fictional universe. Dubbed the “New 52,” the announcements prior to this overhaul were shocking: many of the classic stories would be rendered non-canon while others remained intact. This is a hefty burden placed upon the reader who just wants to read Green Lantern or Wonder Woman. Where does one begin, and could DC’s storytellers successfully write this next chapter in the ever-evolving landscape of their Universe? It’s time to dive into the events that justify The New 52! 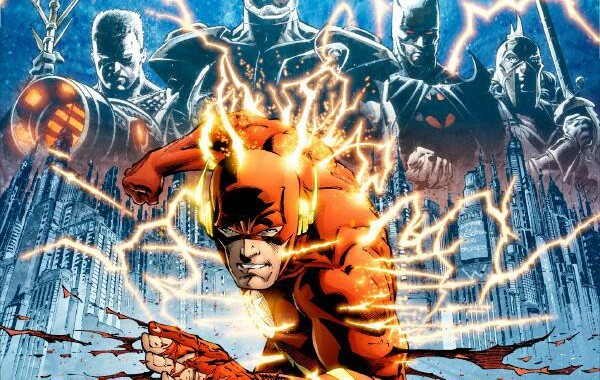 Flashpoint is a collection of all 5 original comic issues bearing the same name. Within it are the events that forever merge the New Earth, Earth-15 and Earth-50 timelines into the single, unified timeline of the New 52. While there are numerous crossovers and tie-ins, we will be examining only the content found in the softcover graphic novel bearing the same name. The series centers around The Flash (Barry Allen) who wakes up in a world he does not know, where his mother is alive, his father is dead and The Justice League as he knows it does not exist. This revelation is confirmed with Barry’s realization that he does not possess his superpowers anymore. After making his way to Gotham City, Allen locates the Bat Cave in an attempt to seek Batman’s aid in regaining his powers. In this strange reality, Batman is revealed to be Thomas Wayne, Bruce Wayne’s father. The plot thickens when Barry’s memories begin to conform to the new timeline and in an attempt to win Batman’s trust, he discovers the uniform of his nemesis, Reverse-Flash hidden inside his costume ring! As he finds himself thrust into the middle of a war-torn Earth, The Flash must regain his powers and reconcile the aberrations in the time stream before his memories are lost forever. Geoff Johns spins the reader a wonderfully compelling story throughout the book, weaving in familiar yet unknown faces in a world at war. Though the fantastic art direction captures both marvelous landscapes and minute details, there is an inherent lack of expansion on finer plot details, explored more thoroughly in the Flashpoint tie-in companions. The inevitable conclusion that unites the 3 former DC timelines seemed rather rushed, as if added last-minute. One interpretation alludes to much greater forces at work while more patient readers view any gaps as breathing room in order to flesh out this newly unified universe. Nevertheless, Flashpoint is a must read, must own and must know book for any true DC fan. Posted in Latest News and tagged DC Comics, Flashpoint, New 52, The Flash. ← Superman – Corny or Cool?